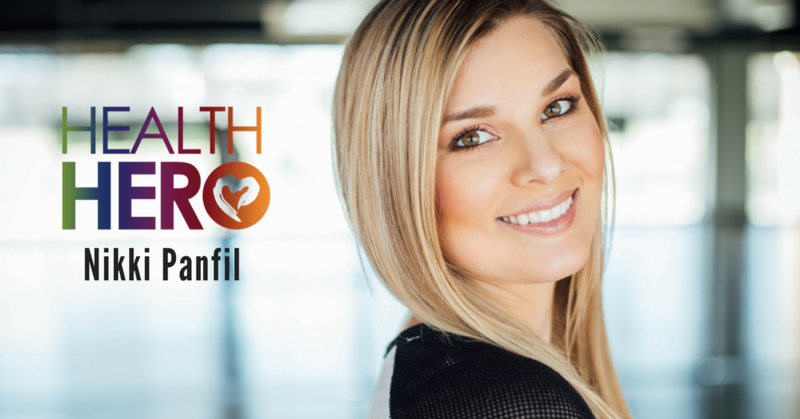 This week we would like to introduce you to Nikki Panfil, our latest Health Hero. Many people have heard the term “Post Traumatic Stress Disorder” or PTSD in relation to our veterans coming back from war. Nikki was diagnosed with PTSD when she was attending college at the age of 18. She had experienced years of domestic abuse, neglect, and sexual assaults and she had become addicted to opioids in her senior year of high school. When she left school, it was her grandmother who suggested that she should be diagnosed with PTSD. Nikki thought it was something that only veterans had but soon discovered that many women and children from traumatic backgrounds experience this as well. Once diagnosed, Nikki went back to a small community college and was fortunate to make friends with an older woman who helped her meditate and allowed Nikki to nurse herself back to sanity. Nikki says that meditation was the first thing in the world that allowed her to find peace and heal her body. Nikki continued with meditation and began to learn yoga and Reiki as well. Nikki credits yoga with teaching her how to love herself and see her worth. It has also enabled her to use her prefrontal cortex as opposed to the amygdala. She credits yoga for teaching her compassion, She has been able to reconnect with others and have a greater tolerance towards those who hurt her or misunderstood her. This week’s Health Hero has battled through abuse, neglect and sexual assault and has found peace with the world. Nikki plans on working with others to teach them both meditation and yoga and this is why she is this week’s Health Hero! Read more about Nikki’s story here in our Health Hero Magazine.